The priest then takes the paten or ciborium and goes to the communicants, who, as a rule, approach in a procession. 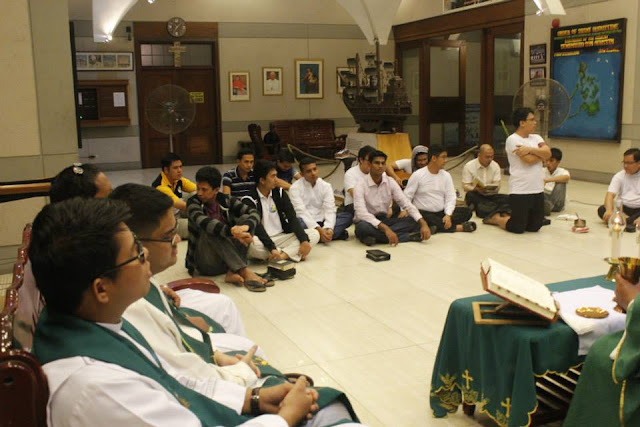 If you have priests and seminarians like these, men who are consecrated to perform holy actions, men who are expected to teach us what Holy Mother Church teaches, men who are supposed to tell us what is right, not show us what is wrong and openly defy the Church. If you have men like these, who needs Martin Luther again? 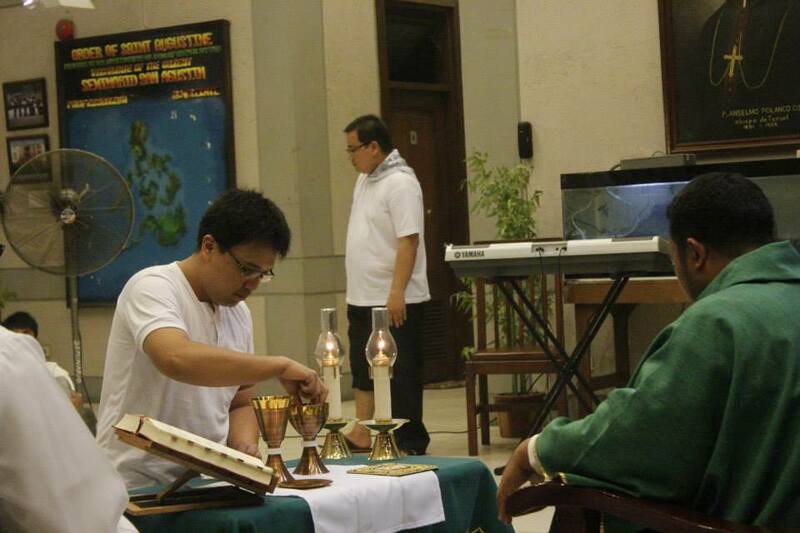 No wonder a lot of liturgical abusers are out to destroy TPC. 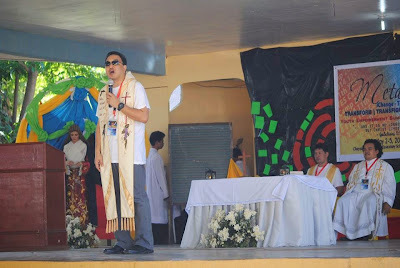 Just as I promised in my previous post, here are the photos of that "creativity" Mass, which for the looks of it, is nothing creative at all. More like destructive Mass, as it deformed the Mass that was given to us. 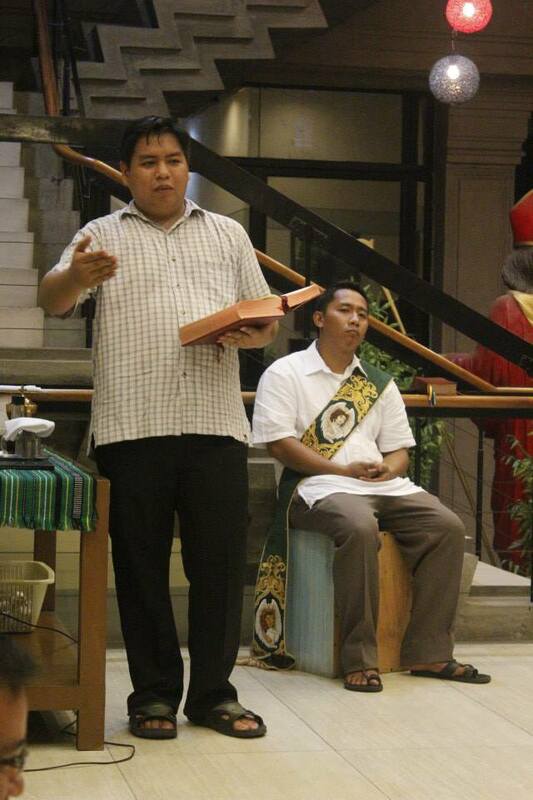 Someone was preaching either the homily or was the psalmist of the Mass. The deacon well.... He is actually sitting on what looks like a box used as a drum, whatever you call that. 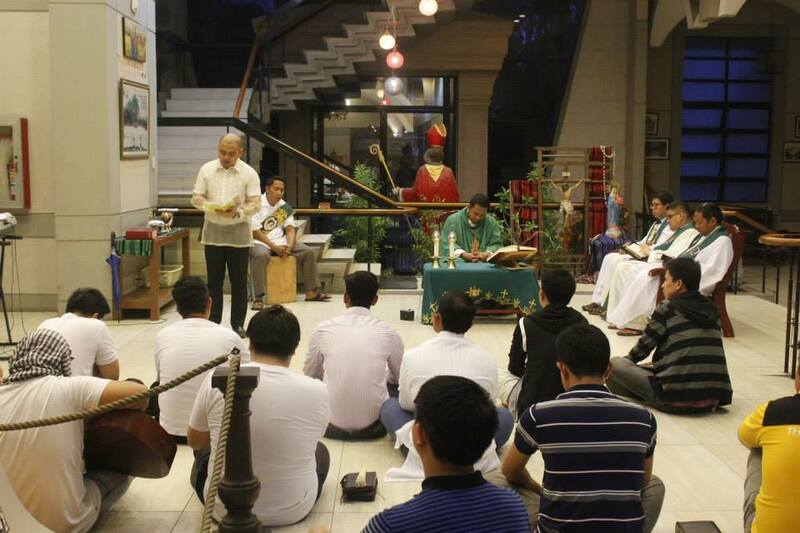 During "Ecce Agnus Dei". 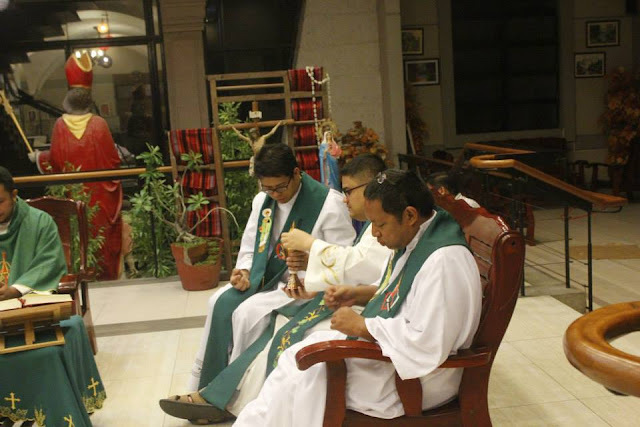 All three priests remained seated. How comfy! 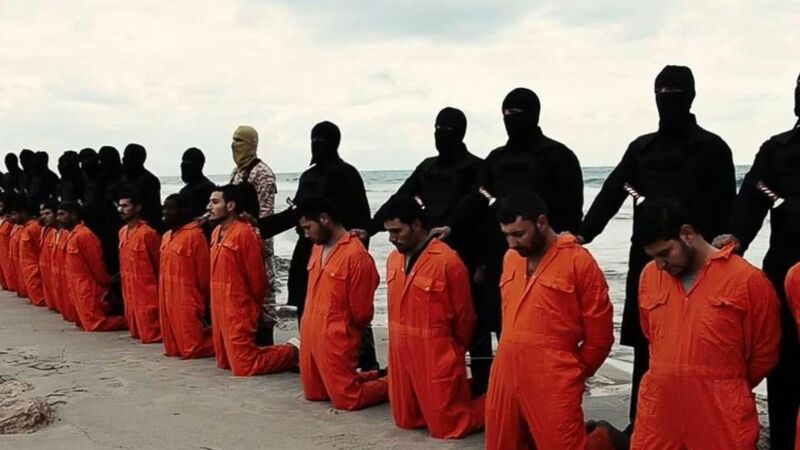 At least one BRAVE soul dared kneeling! We should get to know this guy! So it is a Lobby Mass. They get so bored in the chapel or in their World Heritage Site church, they did something "creative". Mass at the lobby of the monastery and using the coffeetable as the "altar". 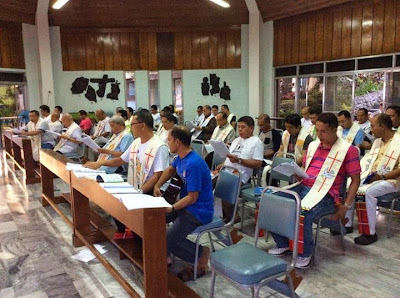 While everyone sits on the floor, except the priests who are obviously more deserving of the seats rather than being on the floor. And what on earth are those behind the priest?!?! Is that supposed to be St. Augustine? Is this a seminary or a kindergarten? Serve yourself, buffet style Communion! Very common in retreat houses and houses of formation for both priests and religious brothers and sisters! Can someone send a note to the Augustinians of Intramuros to stop whatever they are doing. They are MISEDUCATING their seminarians! 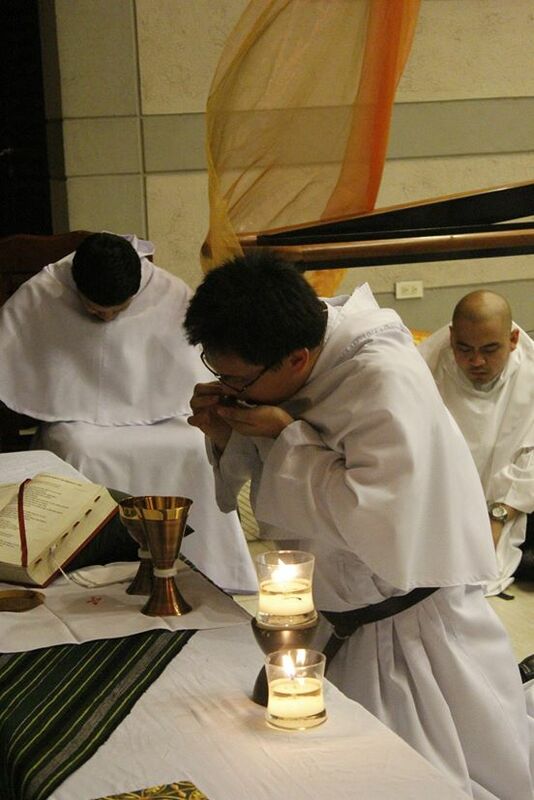 This is not the way to teach future priests to perform holy acts! I am suffering from arthritis and I know the pain. But you have just got to push through with that effort to show how much you love this Person. And so you bend it, even though it cracks, even though it is painful. Because it is the proper thing to do. Because I want to show this as an example to the younger generations. Because it is how I show my love for Him. You see younger ones who would not serve the Mass if it were not a celebrity cleric celebrating. Or if the wedding is not Marian Rivera and Dingdong Dantes. Or the baptism, confirmation and first communion does not involve Liza Soberano. And you see younger ones who don't even kneel. 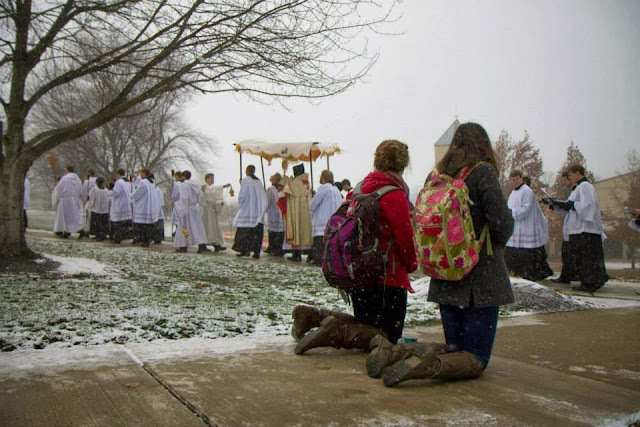 In fact they teach it seminaries, convents and schools of liturgy. Proof of it is that you see it on TV every week. And everyday in parishes. Annibale Bugnini, the master architect of the New Mass, took out almost all of the genuflections of the Mass even though it was not mandated by the Council Fathers or Sacrosanctum Concilium. When he was assigned to Iran as pro-nuncio, it was then that the ruthless Ayatollah Khomeini took power and so a theocracy ruled the country. The Ayatollah summoned the members of the diplomatic corps into his presence and made them kneel down to him as a pledge of obedience. Among those in the presence of the Ayatollah was Bugnini. He knelt. When news of this event reached Rome, members of the Curia, in traditional Italian fashion, joked that Bugnini in Iran was doing all the genuflections he had removed from the Mass. 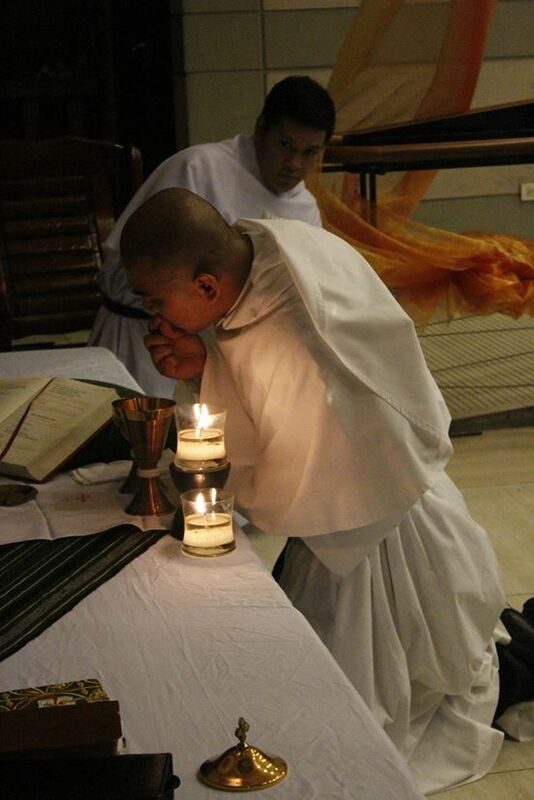 So the next time you are in the presence of Christ, in the church, during Mass, during the exposition and Benediction of the Blessed Sacrament, inside a Eucharistic Adoration chapel.............KNEEL! Do it before the opportunity is FORCED upon you. This was taken from the blog of Rome tour guide, Mr. Orbis himself, John Sonnen. Another account says that the Saint simply didn't like the New Mass and applied for an indult to say privately until his death, the Mass of his ordination. The saint himself is nurtured by the Mass of All Ages. And this is also the same reason why Pope Benedict XVI liberalized the celebration of the Traditional Latin Mass now officially known as the Extraordinary Form of the Roman Rite. Which made me remember something. There was once a raging lunatic cleric who said that those who attend and celebrate the Extraordinary Form of the Roman Rite are "sedevacantists, attackers of Vatican II and haters of Pope Francis". 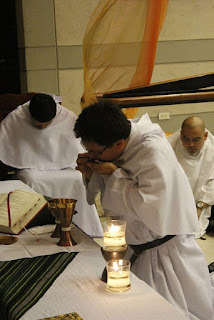 The photo above shows the Saint celebrating the Extraordinary Form of the Roman Rite. Note the placement of the Missal is on the Gospel side (left side of the altar) and the Host is resting on the corporal. That is the reason why the corporal is called THE corporal. The Body of Christ rests on it. 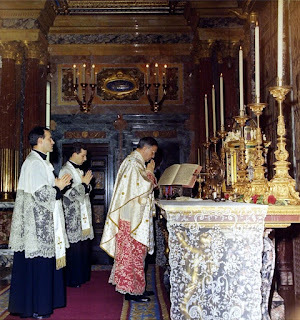 There are those who say that this is NOT a Traditional Latin Mass but a Novus Ordo Mass and they use this photo below as "proof". 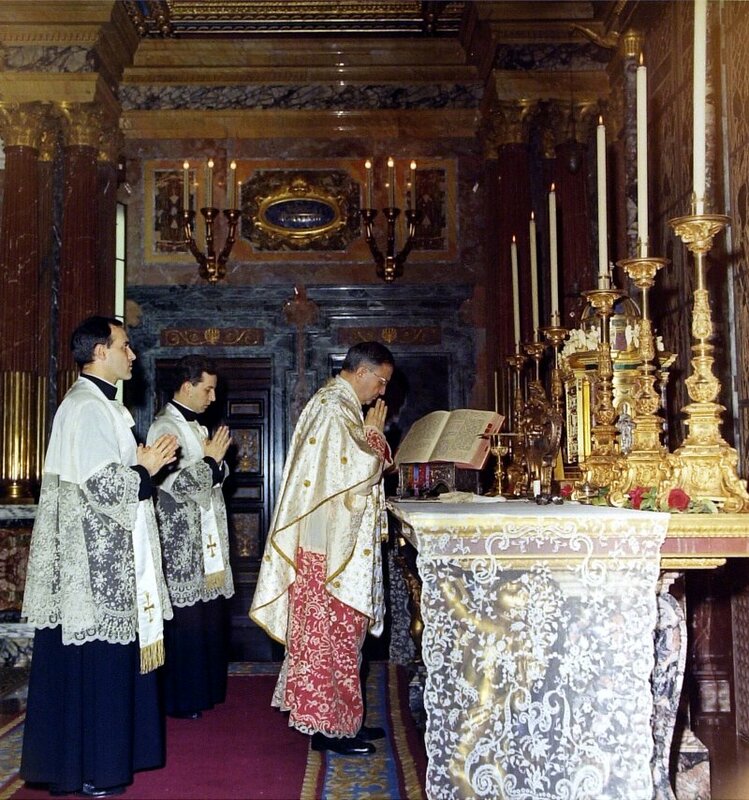 They claim that this is a concelebrated Mass which only happens in the Traditional Latin Mass during an Ordination. If you see priests now concelebrating with a stole over a surplice, that is a ONE IN A LIFETIME thing! Bring out your phone cameras and click away! 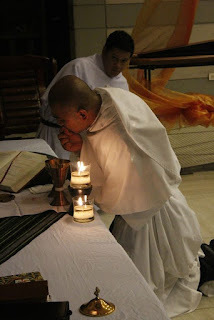 Most Filipino priests especially in their private Masses would celebrate Mass, offer the Holy Sacrifice in their jammies like these! So seeing them in their cassock, surplice and stole concelebrating and NOT in the proper vestments (alb, stole, cassock) is such a PRIVILEGE to behold! 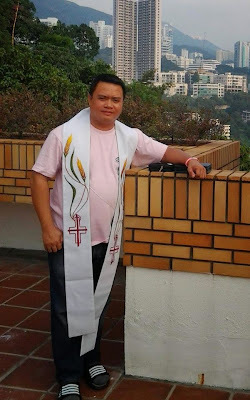 You won't expect these priest to dress up this way when they get invited to a party in a posh hotel or in a VIP gathering in Malacanang or the US Embassy. Noooooooo! They dress properly for every event EXCEPT for Holy Mass. Watch out! I got a lot of photos of that CREATIVE Mass in San Agustin. 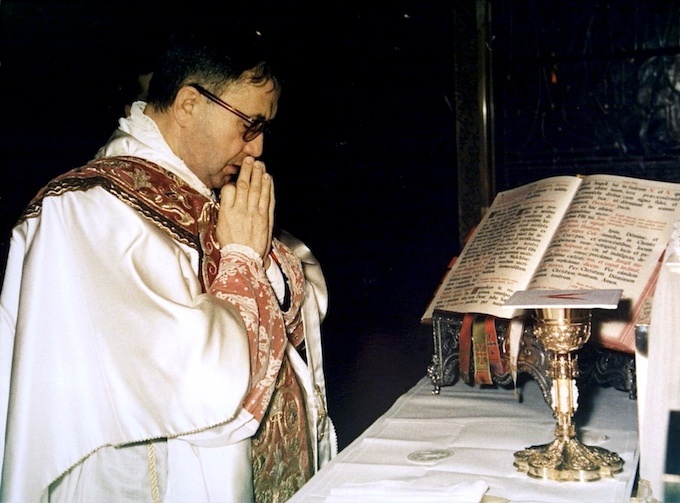 The photo of St. Josemaria with the priests behind him is NOT a concelebrated Novus Ordo Mass. Those priests are properly vested to assist in distributing Holy Communion. Why? 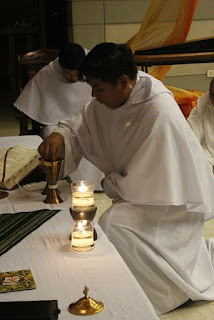 Even today, THAT is the proper vestment for a priest not concelebrating, not celebrating but distributing Holy Communion because a priest, bishop and deacon are the ORDINARY ministers of Holy Communion. 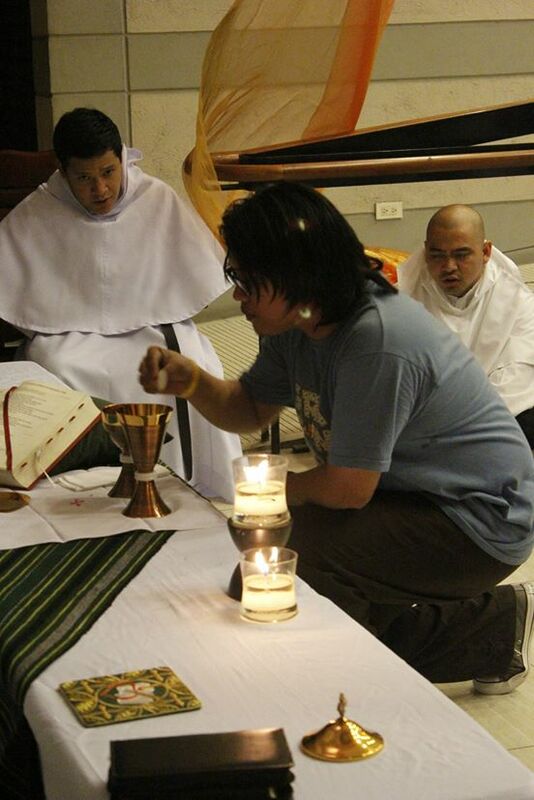 Lay people, including nuns, are EXTRAORDINARY Ministers of Holy Communion. That was a lot for a post. Time to go rest for the moment.